As you begin your online research for OSINT, you will certainly leave digital traces behind you that can be used to track you back. For example, consider an investigator performing an online search for drug dealers in some location, what if the people who were searching-for discovers this search? What if they could know the source of the search (the organization or the person behind the search), the searcher location and even his/her name? If you think that criminal organizations are not technical savvy in computing, I’m afraid to tell you that you are totally wrong. Terrorists and criminal organizations have specialized teams in IT to gather intelligence online, small criminal organizations with limited budgets outsource such tasks to specialized organizations for a fee. Knowing how to work online privately is mandatory, as you cannot conduct OSINT searches with your real identity. 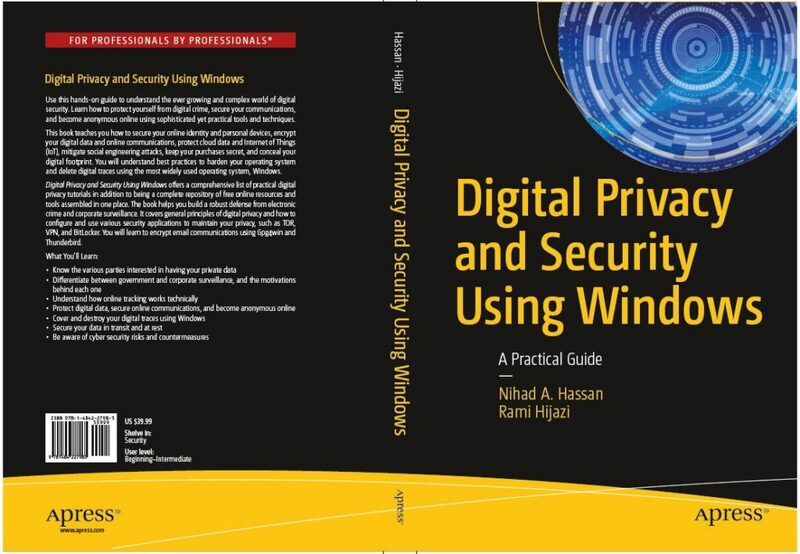 Describing Online privacy concepts and techniques needs a book on its own and cannot be taught through scattered tutorials available online. BookAuthority’s Best Cyber Security Books of All Time. BookAuthority collects and ranks the best books in the world, and it is a great honor to get this kind of recognition. End users, information security professionals, management, infosec students. personal data across national borders. and handling data in the cloud are also covered within this chapter. Windows 10 privacy settings are also covered in detail. techniques to hide your private data in plain sight. and advancements in computing technology and how they will affect your privacy.